Looking for Sports Picks for Tuesday? CLICK HERE! 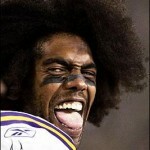 Randy Moss lands in the news for the second straight day. This time…he’s on the move! We’ll assume you know who won the World Series and omit that story today. Congrats, Giants. Moss may not get his wish and return to New England, however. The Patriots’ are 32nd in waiver priority. Early whispers are that St. Louis, Oakland, Washington and Seattle are his top suitors. Let’s just hope we don’t get Randy in Oakland. 2010 doesn’t have to be his career reunion tour, does it? Speaking of Oakland, the Raiders are happy with their 4-4 start but they’re a bit banged up. Tight end Zach Miller was on crutches following their win over Seattle and may have aggravated an arch injury in his foot. His status for next week’s crucial battle with Kansas City is unknown. The news is worse for Raiders shutdown corner Nnamdi Asomugha. He’s been diagnosed with ankle sprain and the usual timetable for that injury is four to six weeks. Things are really looking up for the New England Patriots, who already own the NFL’s best record at 6-1. Left guard Logan Mankins will sign his tender today and is eligible to return to action this Sunday. Quick Donovan McNabb saga update: Mike Shanahan elaborated on his decision to bench McNabb for the two-minute drill on Sunday. It wasn’t that Donovan wasn’t skilled enough to handle it; it’s that his cardiovascular fitness wasn’t up to snuff. I guess running between plays is too tiring. Insert Chunky Soup joke here. The open market begins now that the World Series has come and gone. Among the 142 free agents is an interesting mixture. There are big fish definitely looking for megadeals like Cliff Lee, Carl Crawford, Jayson Werth and Victor Martinez. There are old guns for hire on the cheap like Paul Konerko, Jim Thome and Manny Ramirez (though Konerko won’t come so cheap after his 2010 campaign). And, of course, there are franchise pillars whose free agency is a mere formality, like Derek Jeter and Mariano Rivera. Those guys aren’t going anywhere, right? A former key piece of Portland’s championship puzzle has passed away. Maurice Lucas was known as “The Enforcer” because of his physical play at the power forward position. He averaged 20-plus points and 11-plus rebounds during the Trail Blazers’ championship 1976-77 season. He passed away at age 58 after a long battle with bladder cancer. All-Star Atlanta Hawks center Al Horford, chosen third overall in the 2007 draft, has signed a five-year, $60-million extension. Horford broke out last year, averaging 14.2 points and 9.9 rebounds per game. He was the first Hawks draft pick to make the All-Star game since Kevin Willis in 1992. Looks like Washington may have trouble putting a scare into No. 1 Oregon this week. Jake Locker played through a broken rib in last week’s 41-0 loss to Stanford but won’t test it this week against the Ducks. He’ll sit out and won’t play until Nov. 18 at the earliest since the Huskies have a bye following the Oregon game.